…Kim Stanley Robinson’s New York 2140! It’s the latest novel (2017) from one of the major sf writers of our time. The book asks us to imagine a New York City drowned by aggressive climate change, but still alive and thriving as not just another Venice, but a “super Venice.” Multiple plot lines follow lawyers, social media stars, ambitious lads, expat landlords, a boat-happy financier, and more as they navigate waters literal, political, cultural, and atmospheric. Things buzz along at quite a clip until they take off for a massive climax. Along the way chapters are interspersed with Greek chorus-style ruminations on changing New York. Ultimately it’s a big love letter to NYC from a Californian… and a deep, imaginative, fun, and provoking look into the near future. Just what the book club ordered. The book is fantastic. Robinson pulls off a completely believable world of rising oceans, coastal flooding, and economic cataclysm brought on by un-checked unchecked carbon emissions and the resultant global warming. New York 2140 is so much more than a climate change fable. The book is a NYC history lesson, a treatise on comparative economic systems, and an entertaining adventure story. What would man made climate change skeptics make of this fabulous book? So it’s great. You’re excited to read it. Now, how do you participate in our reading? July 30 – Part Three. Liquidity Trap; Part Four. Expensive or Priceless? How can you share your thoughts? Easy. Every Monday I’ll post about the reading, adding some observations and discussion questions. You can respond in comments. And if you fall behind, or are reading at a later date, no problem; the comment box will remain open. You can also share your thoughts on other platforms. Sometimes readers will post from their own blogs, and I’ll link back to them. Others will use Twitter, and I will embed or link to their tweets. Still others will make all kinds of web content, which I build links to. Meanwhile, all blog posts for this reading will be organized under a single tag, NewYork2140, so all of that content is available in one spot. If you’d like to see how this works in practice, check out our reading of We Make the Road By Walking. You see my posts, people’s comments, and also links to and examples of readers’ work elsewhere on line. Our readings of Soonish and Lower Ed are also exemplary. Now, there’s one more way to add to your reading. 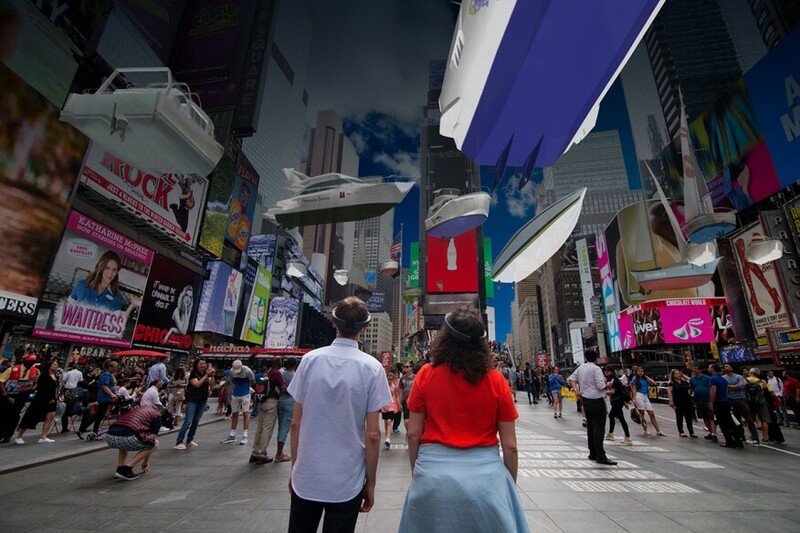 If you can get to New York City over the next month or so, a mixed or augmented reality (AR) project offers to show you what Times Square could look like were it flooded by climate change. Mel Chin’s Unmoored sounds pretty awesome (watch for the boat information), and a fine visual counterpoint to Robinson’s novel. Interested? Grab a copy of New York 2140 and join us! PS: actually, the vote was a tie between New York 2140 and Cixin Liu’s Three Body Problem. I made a difficult executive decision, as Robinson’s novel seemed slightly more of the moment than Liu’s. It was difficult because I really like both books. Read Three Body Problem at the same time and see what you think! As you know, Bryan, I’ve already read the book and blogged about it more than a little (see posts here). I’m presently working on a project with Charlie Keil, ethnomusicologist extraordinaire and peace activist. Think of it as a future-oriented survival manual from an anarchist-groovologcal-green POV (CK’s also a bit of a Luddite, which I’ve got to dial-back at bit) and small enough to fit into a convenient pocket. One of the things I want to do is provide a scenario or two for the future & I’m thinking NY2140 provides a good basis. But I want to tweak that world a bit. Just of the top of my head, I’m thinking we’ve got some form of universal basic income and, in consequence, more people spend more time making music, dancing, writing fictions, poetry, playing games and so forth. The level of expertise is higher. Add to that a bit more weakening of nation-state governments and bit more power & agency devolving to lower levels and, you know, maybe just a bit more for a wealthy transnational cosmopolitan elite. Or maybe not power, more like freedom to move, to balance the balls across the globe, not to mention the moon, asteroids, and Mars. What’s that world like? Bill, thank you for gathering up your New York 2140 posts under one tag. I’m adding them to tomorrow’s post right now. I admire your work with CK and think the world needs it. Naturally I’m full of ideas and suggestions. Have you brought up PM’s_bolo’bolo_ or Rebecca Solnit’s _Paradise Built in Hell_ , for instance? I’m happy to help, depending on time and fit. Your scenario sounds pleasant, a bit like an inversion of Marx’s inverted idyll (“The less you eat, drink, buy books, go to the theatre, go dancing, go drinking, think, love, theorize, sing, paint, fence, etc., the more you save and the greater will become that treasure which neither moths nor maggots can consume – your capital”). What will that cosmopolitan elite do in a world where the nation state has been weakened? I’m not familiar with the PM or the Solnit, but I just downloaded a PDF for the 1983 edition. So, the earth has c. 7B people, if we take them 500 at a time, that’s 14M. That’s a lot of little tribes. I’ll take a quick zoom through when I get a chance. As for my cosmopolitan elite, one reason that nation state has been weakened that members of this elite hold high positions in mega-corporations that deprive nations of tax revenues by moving money around. Perhaps the Soros-like elite is, among other things, underwriting CK GOOD – Global Organization Of Democracies. Membership is limited to SMALL DEMOCRACIES; Japan is likely too large. And Musk-like ones might be mining the asteroids and exploring Mars. Lots of little tribes indeed. Did you read Malka Older’s future politics novels? We read her first one a few years ago, and it’s a fascinating exploration of what happens when the world is built around many tiny polities. Small democracies might be key, if not necessarily at the bolo/Elder scale. I’ve not read any of them, Bryan. Thanks for the link.